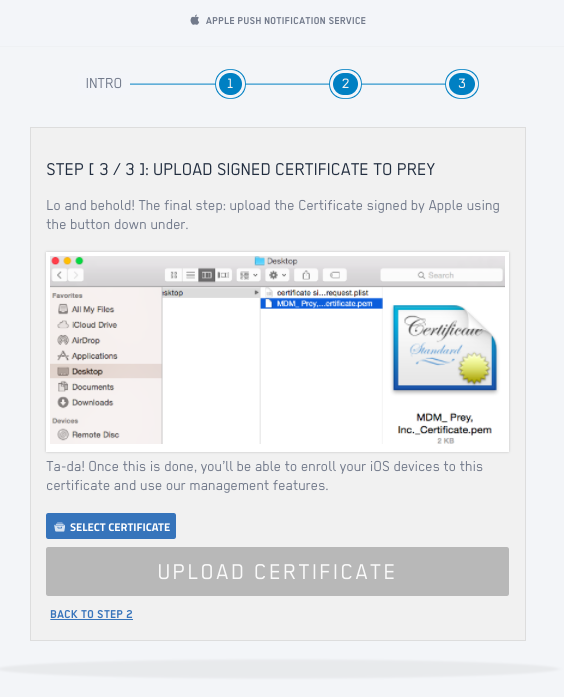 To activate management features ( Lock, Wipe) on iOS Apple devices from 1.7.7 up, and MacOS, Apple requires a trust-certificate from Prey that confirms you are the administrator of said devices. 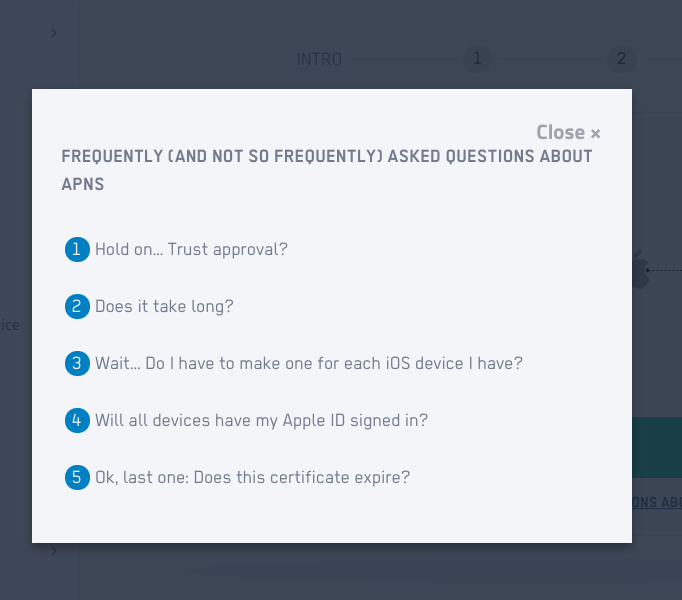 This individual certificate lasts for a year and devices need to be manually enrolled in order to direct Apple to the approved devices. We'll let you know in advance when its time to renew so you don't experience service loss! Grab your desktop or laptop computer and login to your Prey Account through our website. Why using a desktop or laptop? The process involves handling your iOS devices while doing the process, and you'll have to navigate quickly to complete it. You can find the Apple Push Notification Service tab inside the Settings menu on the left-hand sidebar. It's never too late to be informed! Clear all doubts and concerns, both common and odd, by reading the FAQ before beginning the Apple Push Notification Service process. Good to go? Hit that Ready button! You'll be taken to Step Number 1. 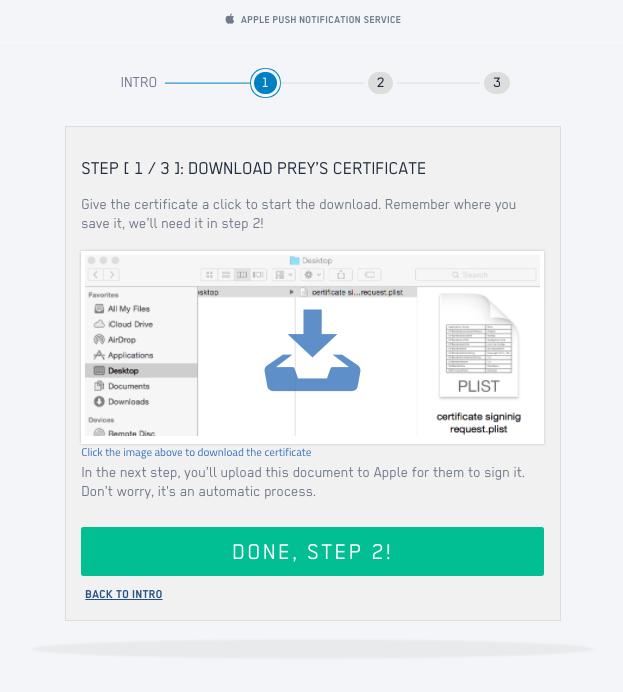 We will generate a Certificate linked to your Prey Account and that document will be the one you exchange with Apple for them to sign and approve. Naturally, step number one is downloading the Certificate signing request.plist file. Click the image and save it somewhere accessible, like the desktop! Enter to Apple's Certificate Website and Upload Certificate. Now you will need to upload the certificate file to Apple, who will automatically sign and validate it. This will generate a new copy of the certificate which you have to download from Apple's website. Click the highlighted link to access Apple's website. Log in using your Apple ID and follow the instructions, you will be required to upload the certificate file you downloaded in the previous step and re-download the new version, signed by Apple in the website's final step. The website's flow is detailed in the following GIF! Remember: This Apple ID will be the one marked as the device's administrator, but users can still utilize their own IDs on the devices. After completing the validation process in Apple's Certificate website, you will download the final, signed certificate. Head back to your Prey tab for the final, third step. 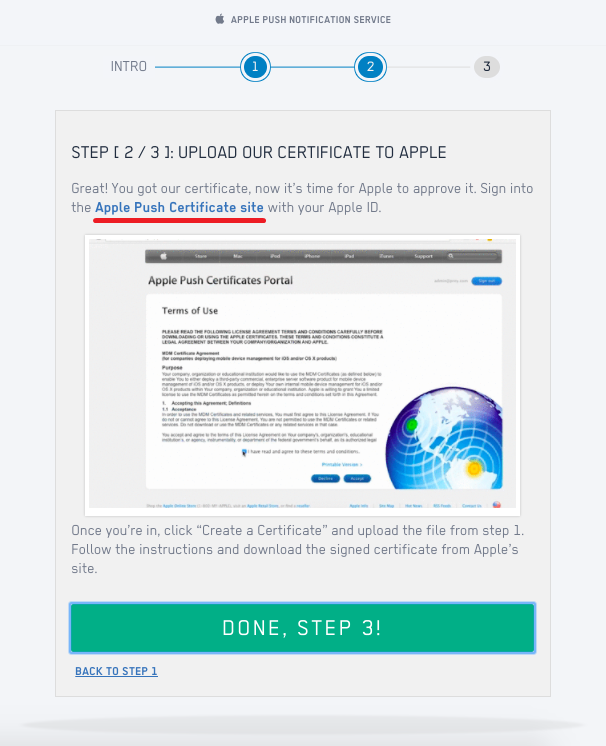 Select the certificate that you downloaded in the previous step (remember, not the first unsigned certificate, but the one from Apple's website!) and upload it to Prey. We will validate, confirm, and link it to your account. This certificate will have a validity period of 1 year, and it can be renewed following the same process. Don't worry, we'll let you know when the time has come to do so! The Final Step: Enrolling your Devices. Presto! 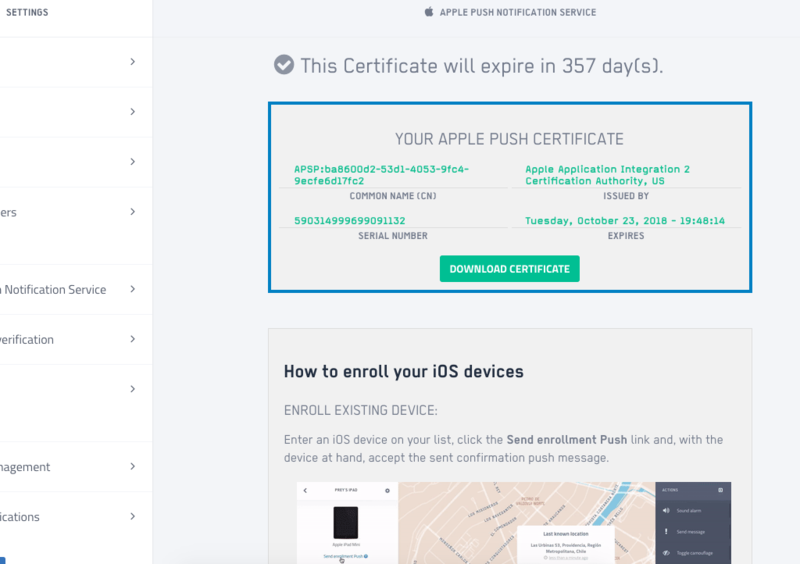 When you visit the Apple Push Notification services tab you will see the certificate's details, its expiration date, and instructions for both the renewal process and the device enrollment process. It's crucial for you to link your iOS and MacOS devices to the certificate, this way Apple will in which devices they need to allow the use of advanced management features.